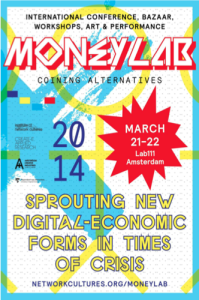 MoneyLab: Coining Alternatives videos and blog reports are now online! If you missed out on this year’s conference or would like to experience it again, be sure to check out the reports, photos and videos of the speakers on the MoneyLab page. MoneyLab: Coining Alternatives, an initiative of the Institute of Network Cultures, Hogeschool van Amsterdam, took place in Amsterdam, on March 21st and 22nd 2014, at Lab111. It brought together more than 25 speakers divided in eight sessions, including an art performance. Other highlights included a crowdfunding workshop and an alternatives bazaar. Download the conference report in PDF.